Skidaway Institute of Oceanography researcher Karrie Brinkley has spent a lot of time in recent months traveling up and down Georgia’s coastal waterways in boats and canoes with maps and binoculars in hand. Brinkley is working on a project to identify and map all the armored shorelines in the state’s six coastal counties. Brinkley has been looking for bulkheads, causeways and rip-rap – the piles or rock or concrete frequently used to stabilize a shore or river bank. The purpose of the study is to establish a baseline set of data to help understand and project the effect of rising sea level on the Georgia coast. 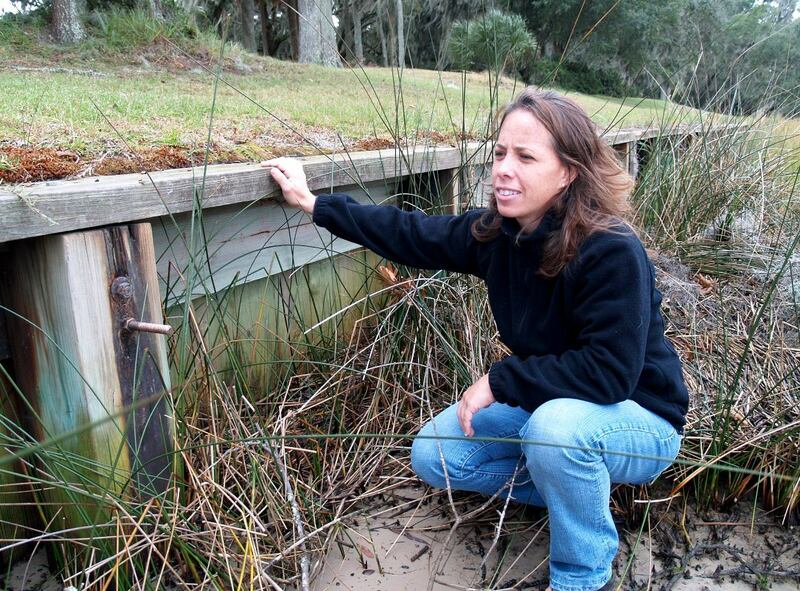 Karrie Brinkley examines a bulkhead armored shoreline on Skidaway Island. Brinkley is working under the guidance of Skidaway Institute professor Clark Alexander. He says that currently the oceans are rising at approximately three millimeters per year, or roughly a foot per century, however many scientists project that rate could double, triple or quadruple in coming decades. This could have a tremendous impact on coastal areas. “One environmental area of concern is the salt marshes,” said Alexander. “If the sea level gradually rises along a natural coast, the salt marshes that thrive in the intertidal zone will gradually migrate to the upland. The study is funded by the Georgia Department of Natural Resources, under the umbrella of a larger Environmental Protection Agency project. 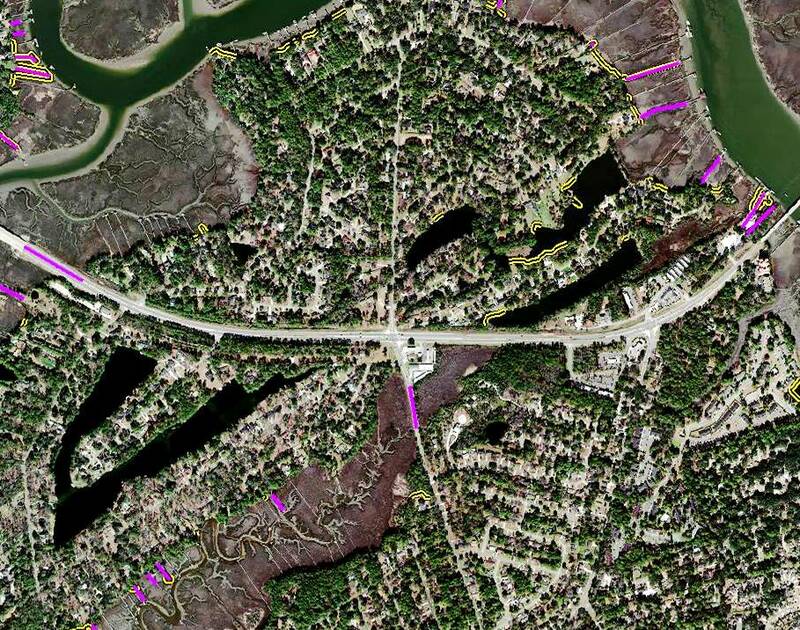 Geographically, Brinkley is studying all the coastal shores, from the beaches westward to either Interstate 95 or US Highway 17, which ever is further to the west. For the first ten months of the project, Brinkley spent her time in front of a computer, studying aerial photographs of the coastal counties. Using a Geographical Information System program, she electronically marked the photos to indicate causeways, bulkheads, rip-rap and other shoreline armor. An aerial photo of Wilmington Island showing causeways in purple and shoreline armor in yellow. There are still many areas that Brinkley cannot characterize from the aerial photographs due to poor resolution, foliage overhangs or other reasons. Even the tide cycle when the aerial photography was shot can affect how much information can be gleaned from the photos. “A high tide may cover some rip-rap and make it invisible in the aerial photograph,” Brinkley said. For those sections, she gets in a car, a boat or a canoe and visits the sites personally. Once completed, the project will be shared with officials in Georgia’s coastal counties. Brinkley expects to have the project completed early in 2010. As burgeoning growth on the Georgia Coast puts additional pressure on the fragile coastal environment, scientists at the Skidaway Institute of Oceanography are researching new techniques to monitor coastal water quality. Scientists can measure water quality several ways. One method is to measure the water’s chemical characteristics, such as oxygen and nutrient concentrations. Skidaway Institute researcher Elizabeth Mann is investigating another technique – using a group of microscopic organisms as a bioindicator of water quality. Mann’s research focuses on one of the smallest of microscopic algae or phytoplankton called cyanobacteria. These organisms are less than 2 microns in size and form the base of the food web. Like plants, cyanobacteria such as Synechococcus contain chlorophyll and manufacture their own food through photosynthesis. Cyanobacteria have many characteristics that make them potentially good indicators of water quality. Synechococcus are abundant in Georgia’s coastal waters and are relatively easily isolated and grown in the laboratory. They can also be identified and counted using flow cytometry, a technique that can accurately count up to 500 cells a second. Mann is examining the water quality in the Savannah River by comparing conditions in that heavily industrialized estuary to the more pristine Altamaha River. “The abundance of cyanobacteria, including Synechococcus, is much lower in the Savannah River than in the relatively pristine Altamaha,” Mann said. “Not only is the total number of cyanobacteria lower in the Savannah River, but certain types of microbes abundant in the Altamaha River are essentially absent from the more heavily impacted Savannah River. In addition, Mann said, adding water from the Savannah River to populations of estuarine phytoplankton from more pristine locations leads to a decrease in the abundance of cyanobacteria and other small phytoplankton. Mann’s work is just beginning. A next step will be to identify the types of contaminants responsible for low Synechococcus numbers in the Savannah River and to determine what effect stunted cyanobacteria populations have on the larger organisms in the food web that prey on these small plants.